Garlic Mashed Potatoes are the creamiest most heavenly mashed potatoes ever. It is an excellent vegetable side dish for your favourite meats such as roasts or even cold meats. Don’t be alarmed at the amount of garlic in this recipe as it is very different when it is cooked. The garlic gives a much sweeter and more subtle flavour once cooked which gives your mashed potato the flavour of France! · Put the garlic cloves in a small pan and pour on boiling water just to cover them. · Boil for two minutes then remove from heat and drain. · Peel the garlic cloves as they cool. · Melt about half the butter in a heavy bottomed pan and add the blanched garlic cloves. · Cook until golden over a low heat – about 15 minutes. · Now put the garlic into a blender with the buttery sauce and blend to a nice purée. · Spoon this into a bowl and cover. Put aside until your potatoes are ready. · Wash and peel your potatoes and cut into small pieces. · Pour boiling water over the potatoes, just enough to cover them and salt to your liking. · Cook over a medium heat until the potatoes are cooked. 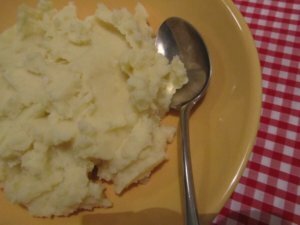 · Drain your potatoes and mash with a potato masher or a fork in the pan. · Return the potatoes in the pan to the heat for about 2 minutes to help dry them out. · Remove from heat and beat with a wooden spoon. · Heat the milk over a medium heat until very hot then beat it into the mashed potatoes and add the garlic puree. Beat well. · Taste your garlic mashed potatoes and season with a little more salt and pepper to your liking. Your garlic mashed potato recipe is now ready to serve.